If you have a poor sense of direction, you’re not alone. Studies have shown that that drivers who were born in the past 30 years are more likely to get lost on the road than those from previous generations. Modern technology makes it difficult to get lost, especially if you have a smart phone, which provides access to practically every map and GPS system on the planet. However, it’s still important to prepare for the worst. What if you accidentally left your smart phone at home? What if you dropped it? What if your battery died? For these and many other reasons, it’s never a good idea to completely rely on technology. Getting lost can leave you feeling very angry and frustrated. Not only are you dealing with all the normal stresses of being on the road, but you are also rolling along, getting further and further from your destination. This situation is understandably frustrating, but if you let it make you lose control, you could potentially cause an accident. Instead, look for a safe place to pull over. Parking for a few minutes will take the stress of driving out of the picture and give you the energy to figure out where you are. If you have a smart phone and were following directions but simply missed a turn, you can easily reconfigure your directions and get back to where you were headed. If not, then you will need to figure out your location the old fashioned way. Look for street signs, addresses on buildings or notable landmarks to help determine where you are. In a world of quickly advancing technology, opportunities to help out a fellow member of society are growing fewer and farther between. Most store clerks, gas station attendants and other public workers will be more than happy to give you directions, and since most of them will be familiar with the surrounding area, the information you get will usually be accurate. If you ever find yourself lost in a bad neighborhood and are not comfortable asking random people for directions, consider waving down a cop. The police are there to serve the public, and if they aren’t busy dealing with another matter, most of them will gladly point you in the right direction or even guide you there themselves. You should never call the police unless there is an emergency, but if you happen to see one sitting there, don’t be afraid to ask. Before you set off to drive somewhere new, get an idea of where you’ll be going. 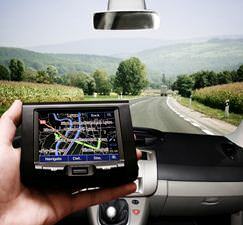 Even if you have a GPS system, it’s smart to keep important street names and intersections in your mind. That way, if you miss a turn, you’ll have an easier time getting back on the right track. Always keep your smart phone fully charged, and consider keeping a good old-fashioned paper map in your car for unexpected emergencies. You probably won’t need it, but if you do, you’ll be glad you were prepared. If you do find yourself lost, try to keep a sense of humor. Unless you accidentally wander into a truly scary neighborhood, getting lost in America will almost never be dangerous. As long as you keep your wits around you, you will be back on track in no time, and your experience will soon be nothing more than a funny memory.